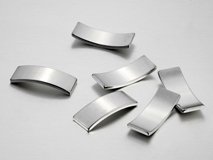 Euke MagTech Limited manufacture and supply large quantity motor neodymium magnets including arc magnets, ring magnet , small disc magnet cylinder magnets for motor and generator factories. We supply the magnet with features of high precision, high consistency, high operating temperatures, low weight loss. The motor neodymium magnets is used by DC motor, high-voltage motors, low voltage motors, synchronous motors, asynchronous motors, micro generator, car motor, mobile vibrating motor ,brushless motor gauges and instrument motor and so on. Motor request high working temperature, so H Series N35H , N42H, N45H, SH series N38H , N40H, N45H , UH series N28UH, N35UH, N42UH , EH Series 33EH, 35 EH grades are more popular among users. Tight tolerance, high - consistency of magnetic strength and balance degree of magnetization direction are important, EUKE owns rice production experience and technology skill, we are able to meet all requirement.